Located between the narrow lanes and unpaved roads where the vehicles don’t enter and everything fancy and designer can be shopped on foot, this place is no other than Shahpur Jat Village. Oh! I said village. Don’t go by the name, it has the essence of more than a village and less than the city. Here at Shahpur Jat; the top most designers like Monika & Nidhi, Samant Chauhan, Pratik & Priyanka have set up their boutiques and manufacturing units because of the space availability and low price tag of real estate as compared to other markets. This holy place for shoppers is a blessing who want everything fancy and designer. 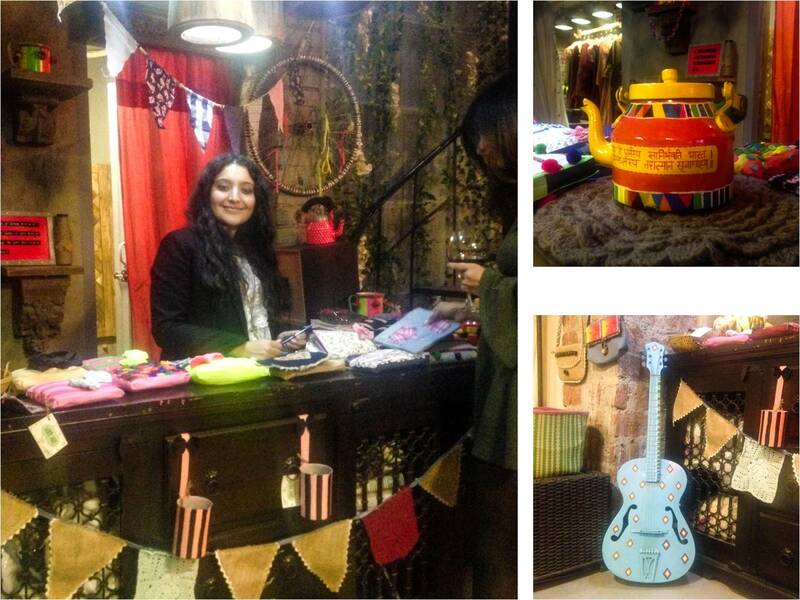 I have been to Shahpur Jat several times before but this time the things were special. 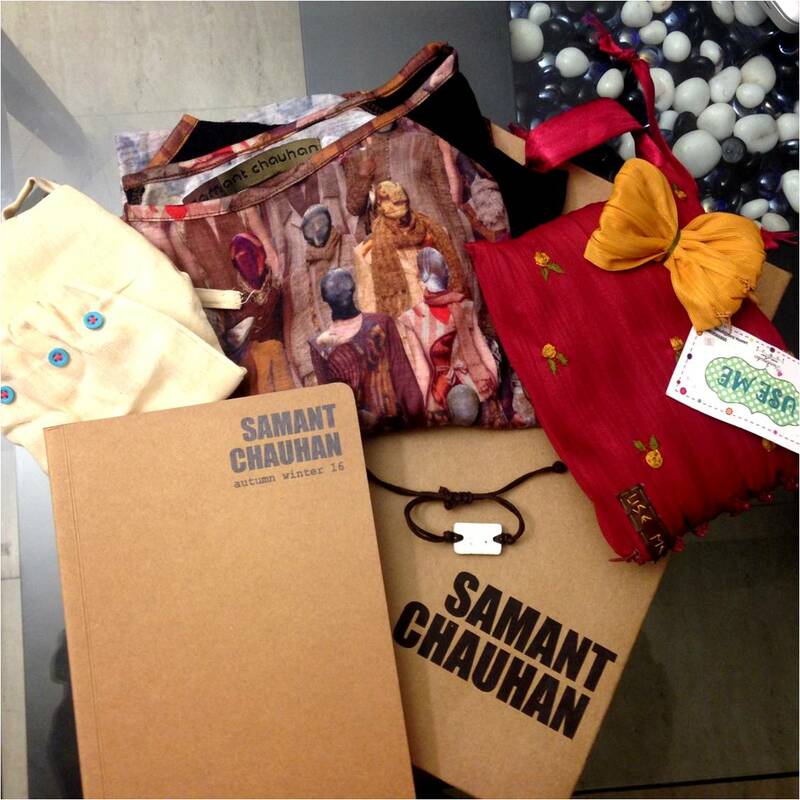 I was invited for “Biggest Samant Chauhan Pre-Christmas Celebration Sale” on 22nd December. 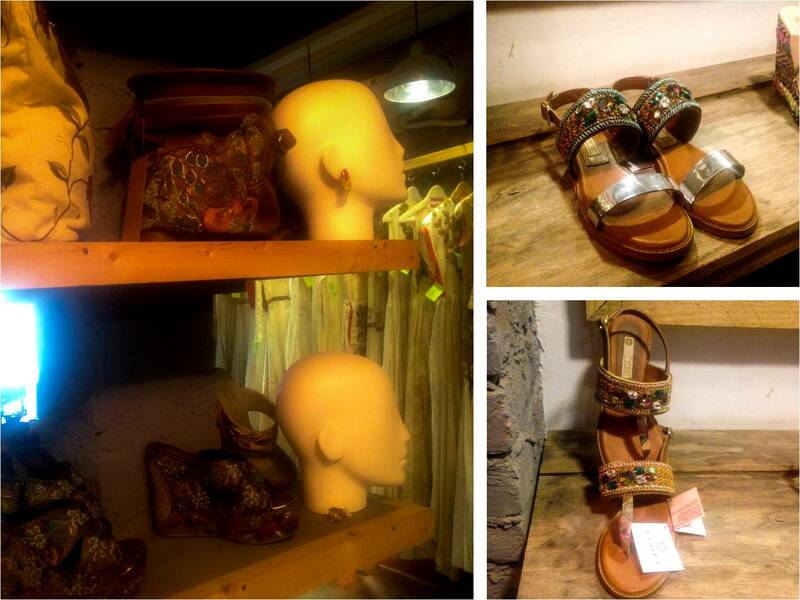 The location for the same was 417, Gora Street, Near Jungi House Lane at Shahpur Jat, New Delhi. This was exciting and thrilling as it was my first event as a Blogger. 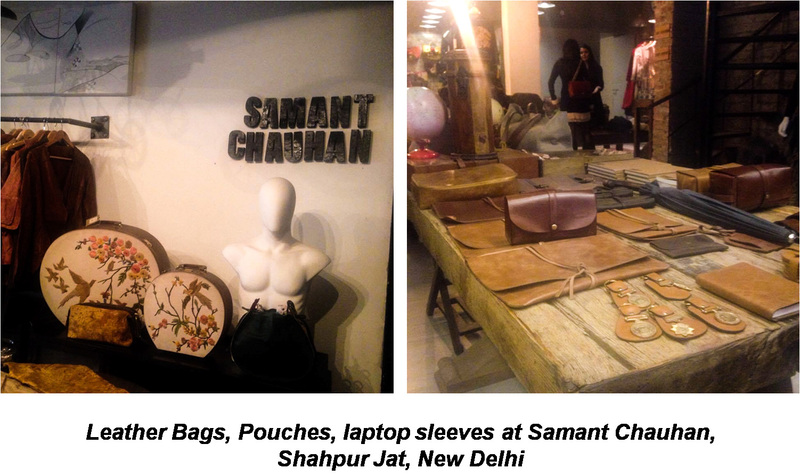 The Samant Chauhan boutique is spread over three floors. The entrance has a nice cool Christmas decoration in white with the wood all around. Everything was so creative. Check these bags with the bird’s embroidery in leather. Aren’t they adorable? I simply fell for one of them. And my luck, there was no discount on it. 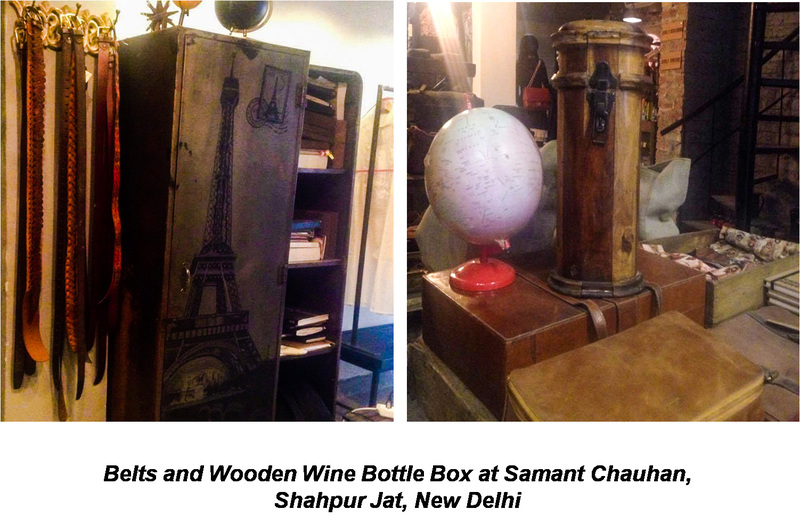 I could catch Mr. Samant Chauhan during drinks for a small chit chat to find out what is so exclusive about his collection. And the answer is their costumes are designed on Bhagalpuri Silk or Tussar silk and they mostly use white, cream and beige colors. White at times can be boring but not when they have a unique style and are made colorful with embroidery and other works on it. Check the few intricate designs I could capture. 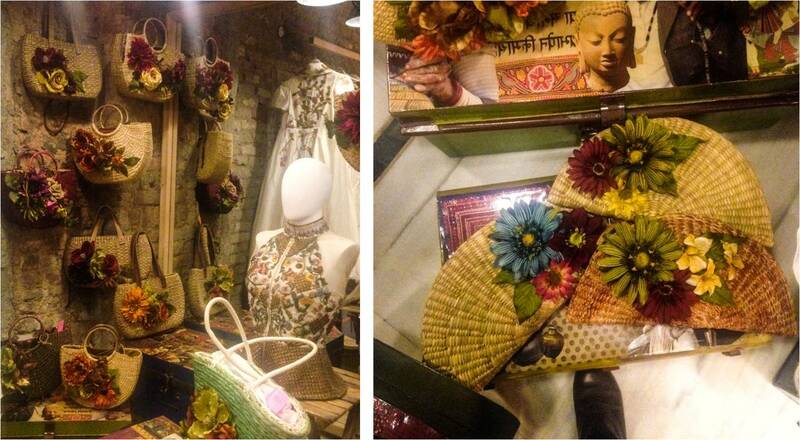 Check out the bag and trunks collection which were the part of wall decor as well as the selling products. 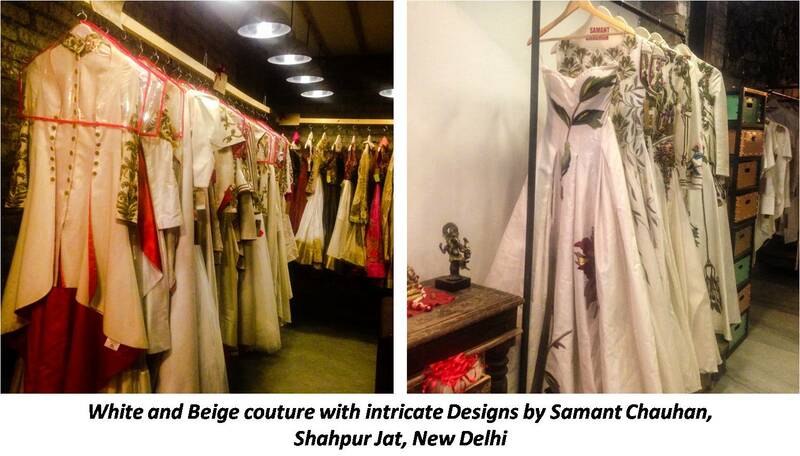 And here are some brand partners associated with Samant Chauhan boutique. The first one is a cute girl Meenakshi, the name behind useme. 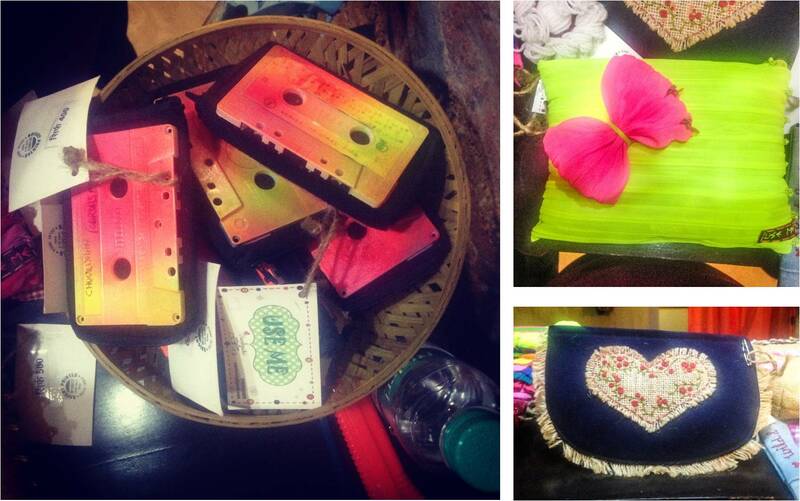 She collects all type of scrap and makes some beautiful creative art pieces out of it. The second Champ is a girl with splendid knowledge of fragrances and perfumes. 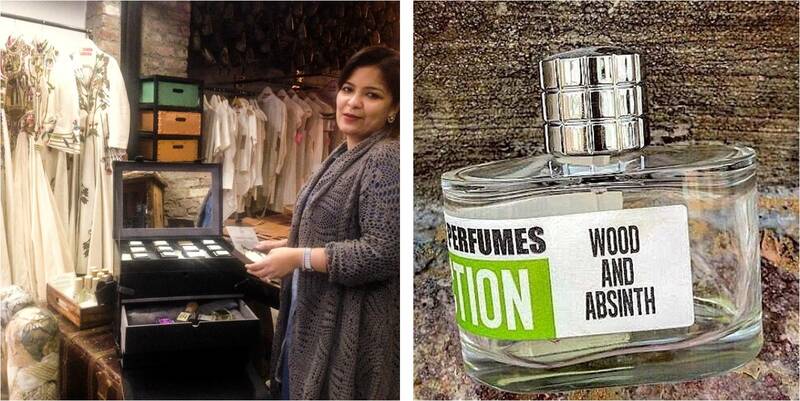 She runs her own brand by the name ITC Haute Parfumerie. I was knocked down by their perfume with wood and absinth fragrance, (I don’t know much about the fragrances but she explained me certain things quite well) priced around 12,000/-. And their other fragrances range usually from 4K – 24 K.
No celebration is complete without drinks. So, how can this be? 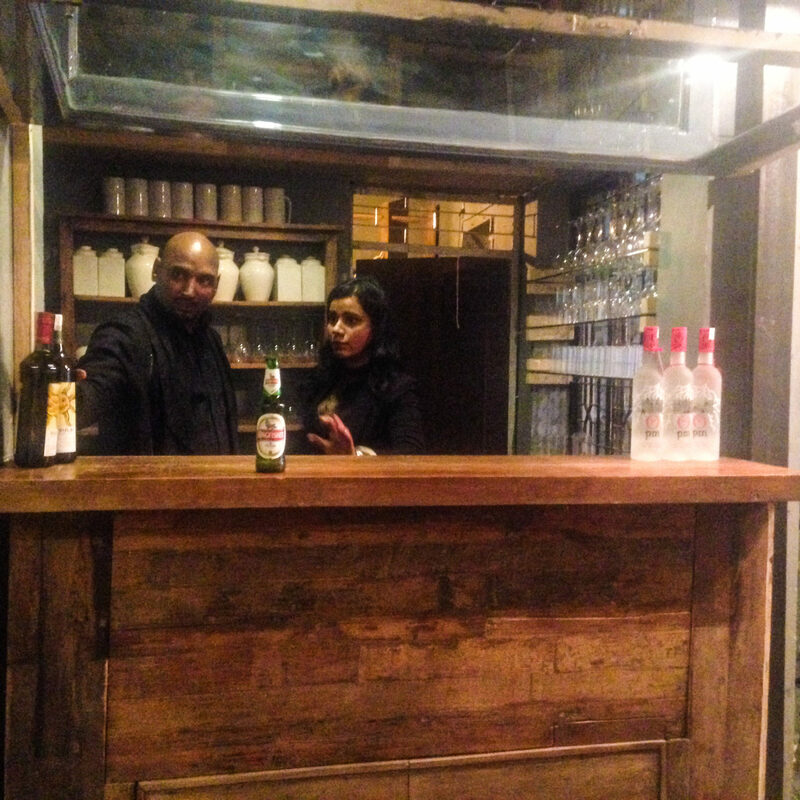 Here was a toast to Samant Chauhan and his success at a small bar within his establishment. And at the end of the day, it was a pleasant goodbye with some Christmas goodies as a return gift. Oh my goodness those couture dresses looks fabulous! Will they offer promo very soon? The minute my eye caught that dress, I wanted it! Thanks for showing us this hidden gem! That flowy white dress on the right, I meant! I really like those couture dresses! Such an interesting post with all these hidden beauties to explore. That looks like a pretty cool sale! The little guitar is so cute! How was the wood absinth fragrance?!!! His outfits remind me of renaissance costume! I loved that Eiffel Tower painting and designer shoes look fab! 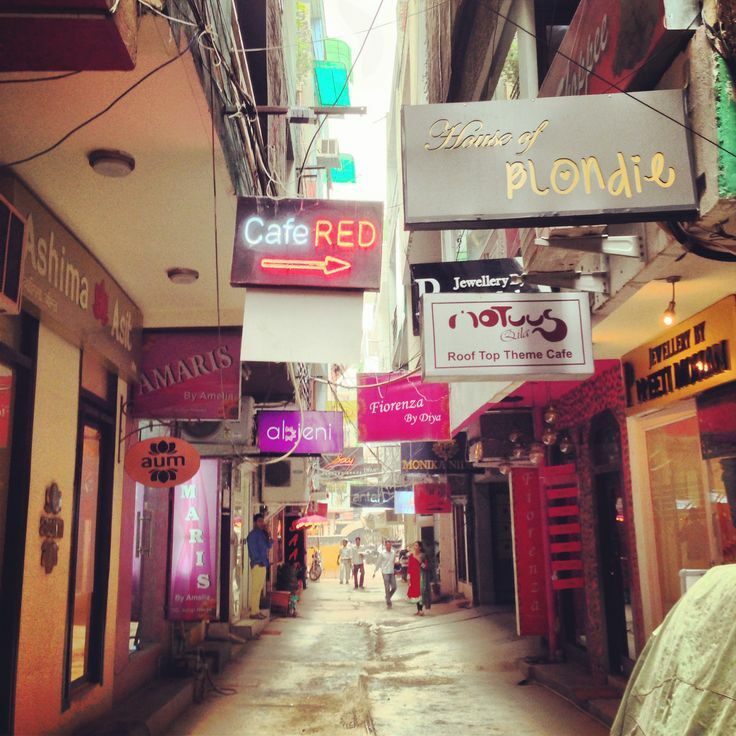 That alleyway reminds us a lot like in vietnam, many small alleyways with multiples shop signs! So many games around you’ve found! What a colourful collection. 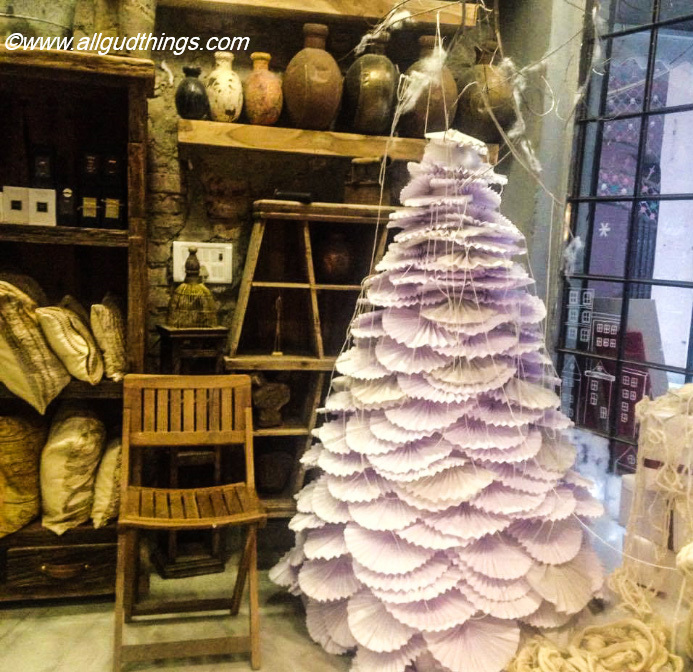 This looks like a great shopping experience.Always love shopping around festivals, be it Christmas or Diwali. One because of cool deals and the huge range of goods available and the second because of the aura of celebrations and festivities that add more colour.